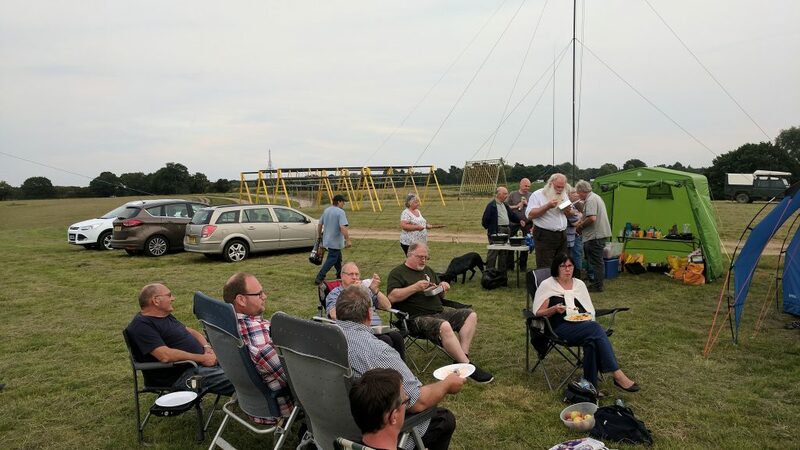 LEFARS and SNBCG Field Weekend. 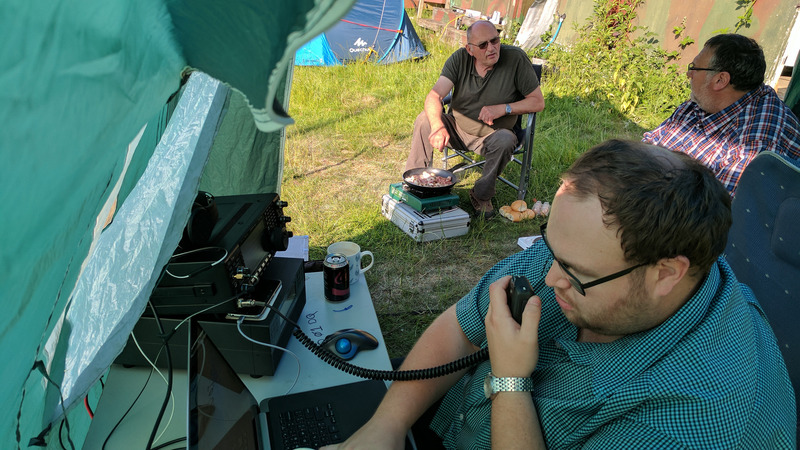 The August bank holiday provided a great time to play some radio, and join forces with another club for the weekend. 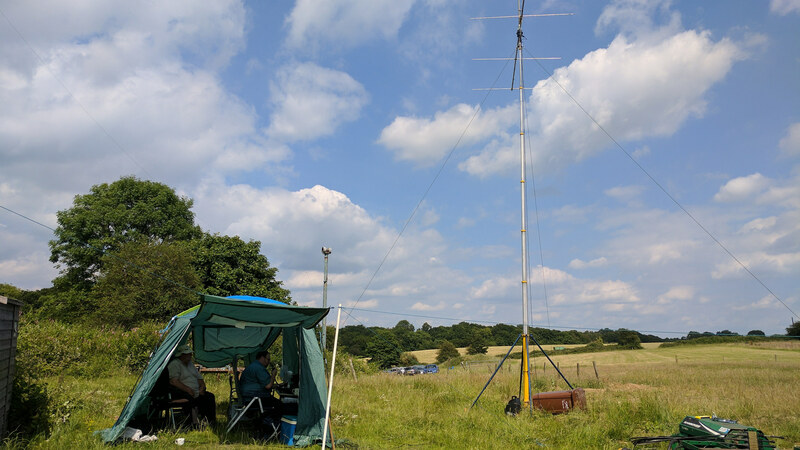 Many of team SNBCG are also members LEFARS, and with an active portable group, this was set to be a busy weekend. 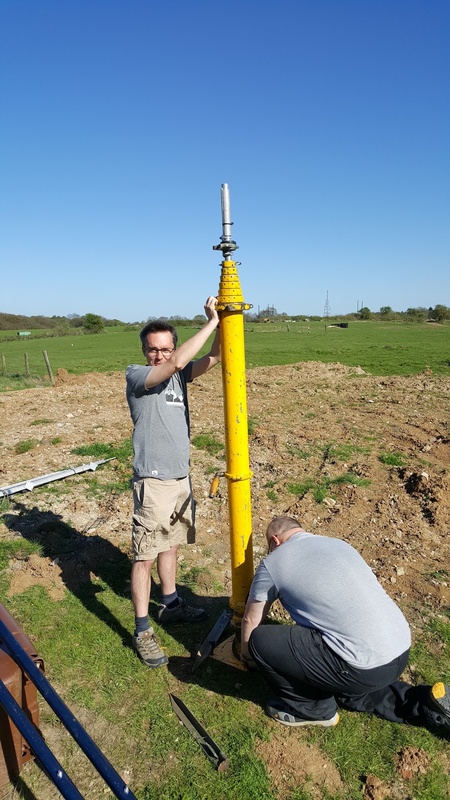 I arrived on Friday evening with Peter G0IPA and Dave G7UVW to setup the initial masts, we put up the 144 MHz beam (9e + mast head LNA). 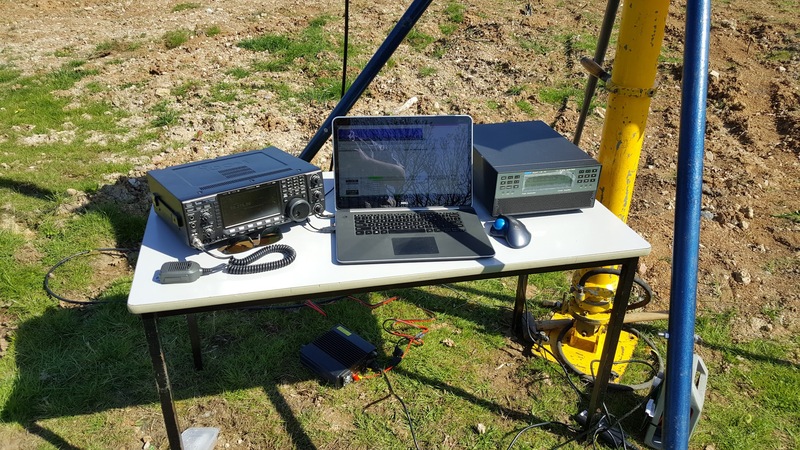 The 18 MHz 3e beam was recently constructed and required some further testing, although initial results were very promising. 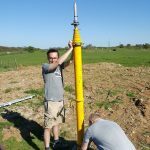 The 7 MHz vertical was constructed from push up poles and 8 radials. 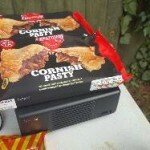 A BBQ was planned for Saturday evening, with Ron G6LTT, Karen and Sharon doing a great job in feeding the masses. 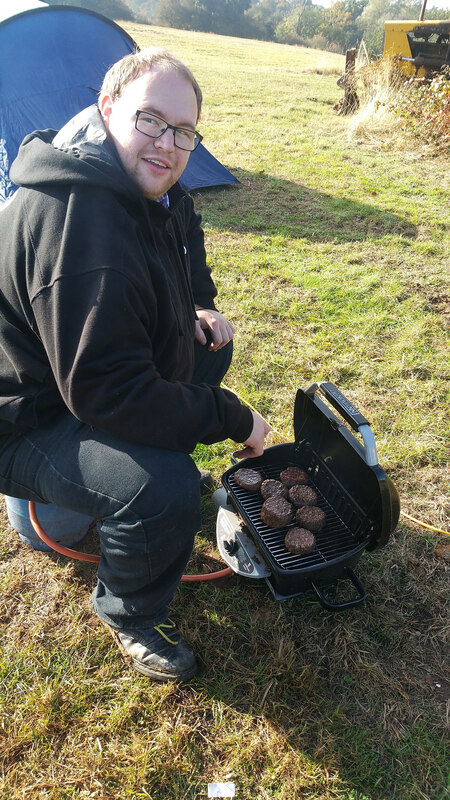 Dave M0MBD also provided a very nice Chili con carne with rice. 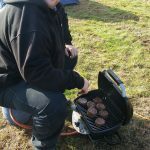 We also had burgers and sausages and some salad, a really nice and very welcome meal. The weather was excellent, with temperatures getting to 27c in the day, and not falling below 18 in the evenings and ideal for camping. 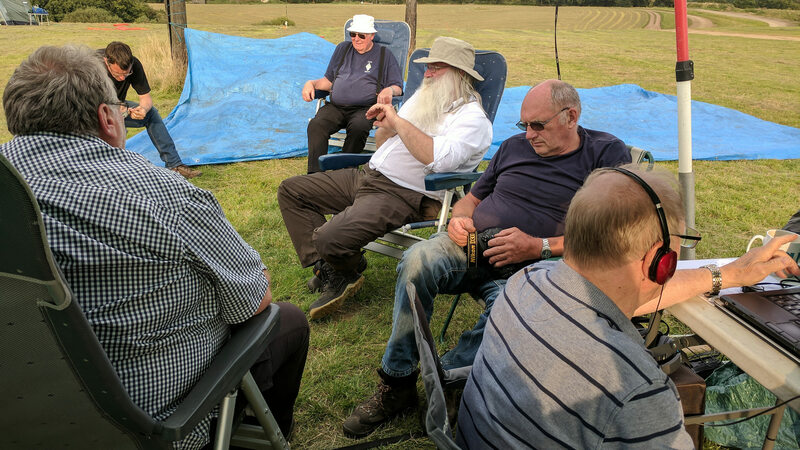 The turn out from both clubs was excellent with members travelling from far and wide to partake. A WSPR transmitter was setup for the weekend using the QRP Labs with a 200mW output into some wire. 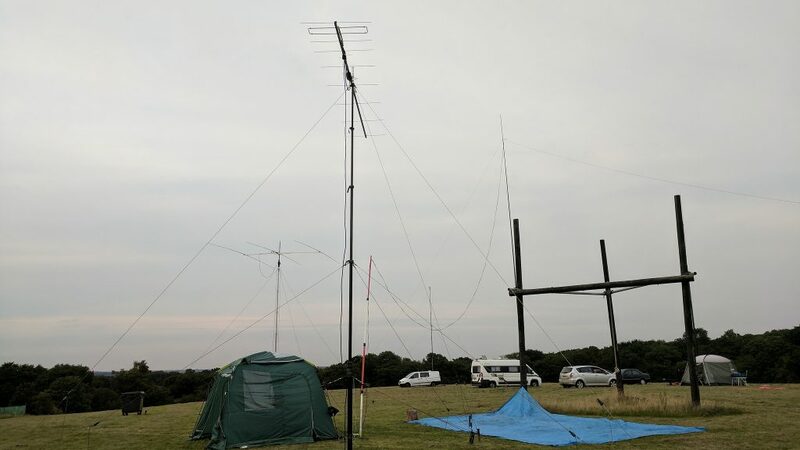 This provided an indication of the band conditions and was active throughout the weekend. 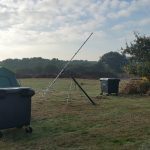 John M0IDA dropped in on Sunday with his arrow satellite antenna and provided a demonstration on working through satellites. 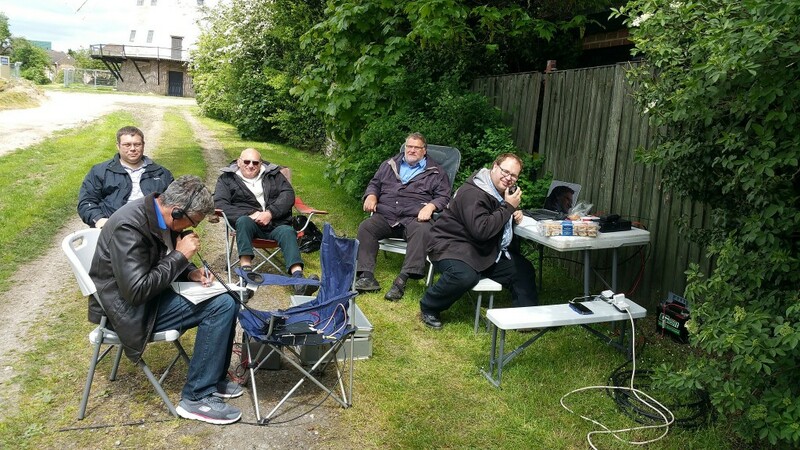 Altogether a very successful weekend with members operating on 3.5, 7, 10,14, 18, 21, 24,50 and 145 MHz over the weekend, making close on 1,000 QSO in 80 countries. 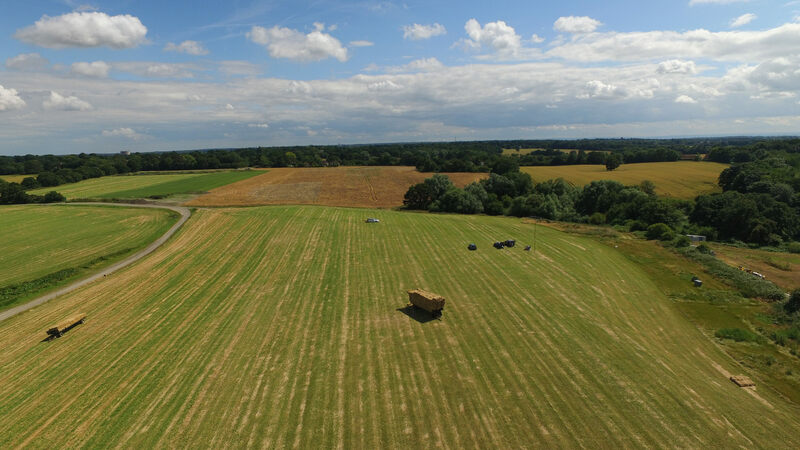 Further pictures from the weekend are available here. 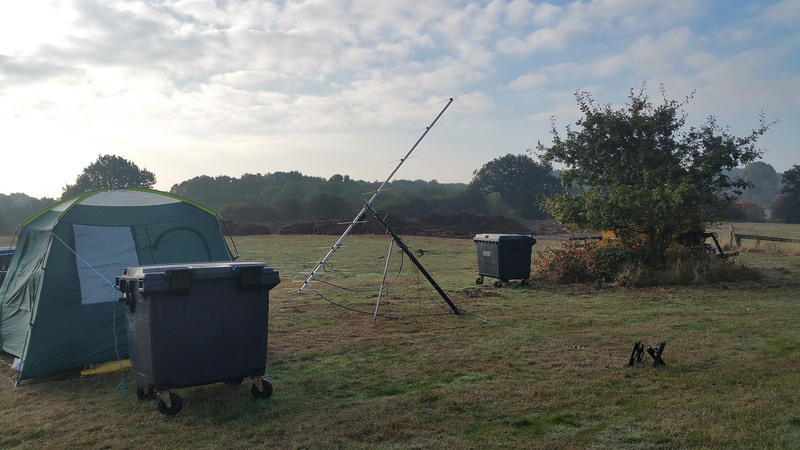 We set up Saturday morning, using the 5e 50MHz beam and a 10m pump up mast. 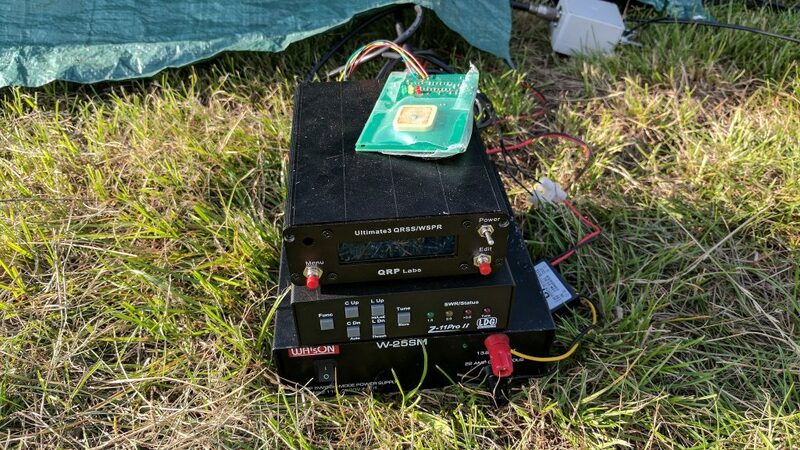 A solid state amplifier provided 400w and a light weight tent to keep off the sun. 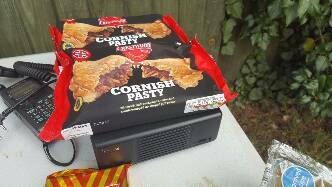 The most important issue throughout the weekend was trying to keep cool, with copious cold drinks from the fridge. 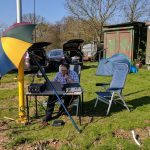 Fred G3SVK was kind enough to lend us a fan and this became an essential item for the shack. 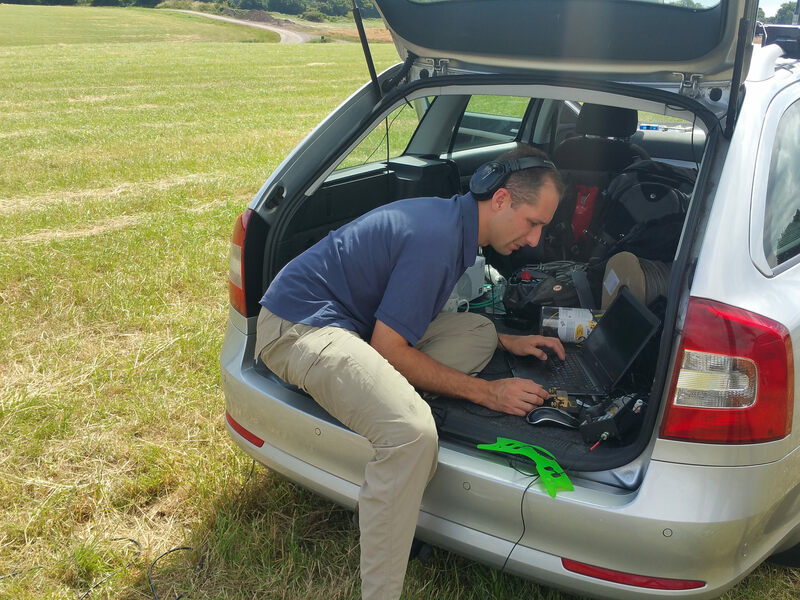 Fred spent some time operating on CW, working mostly EU with the odd notable exception. 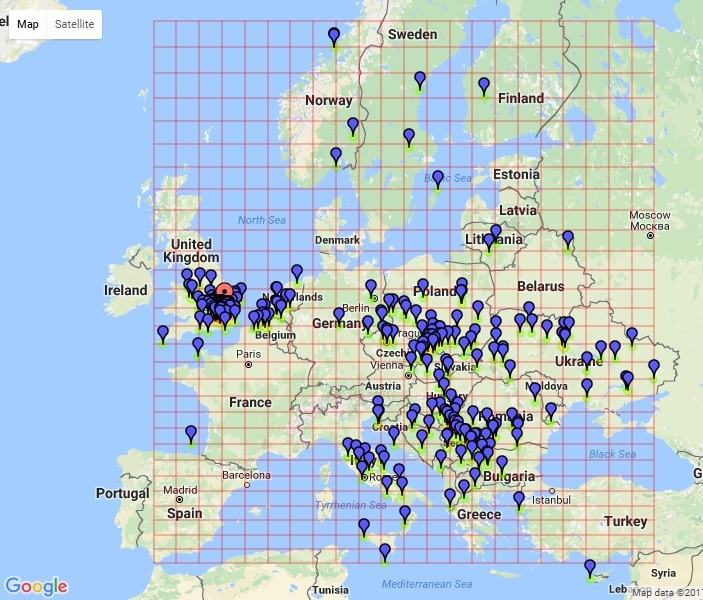 In total, we worked 250 stations, with our best DX being 5B4AAB at 3161KM. 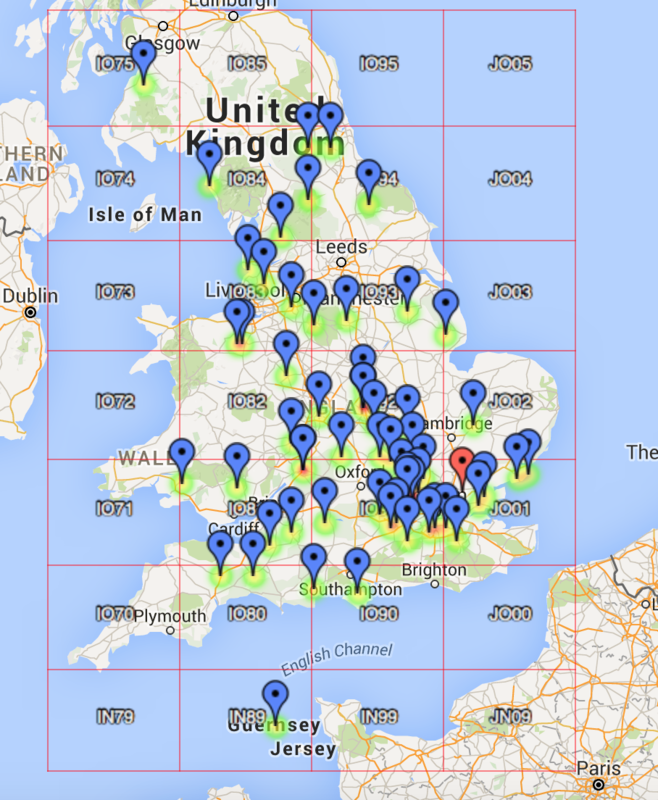 You can view the claimed scores here and map here. 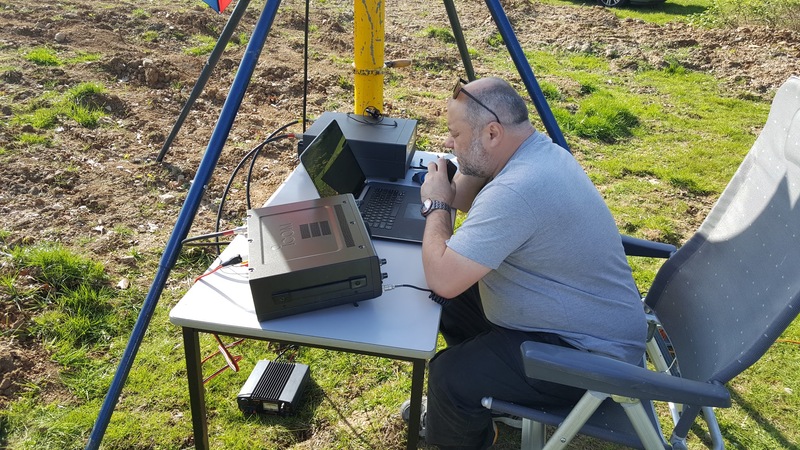 Members of the SNBCG took part in the first 50 MHz contest of the year at the Kelvedon Hatch SNB using the club call M0SNB. The contest ran from for 3 hrs on Sunday morning (10 till 1) the weather was forecast to be 23C and sunny. 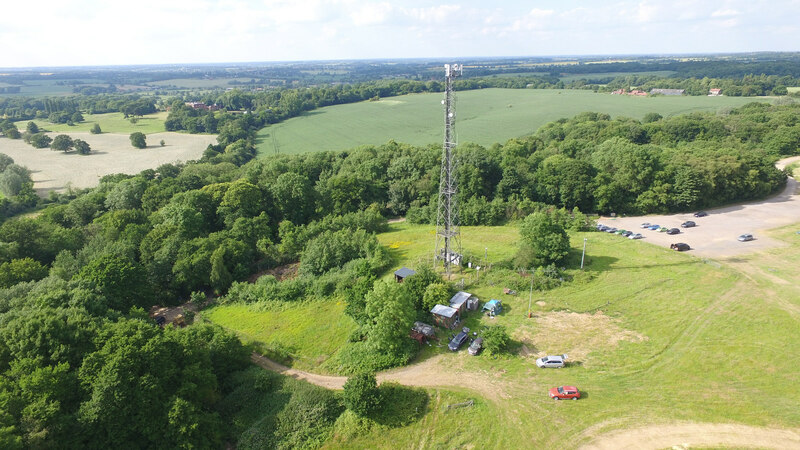 We opted to operate outdoors using a 5e beam on a 10m pump up mast. 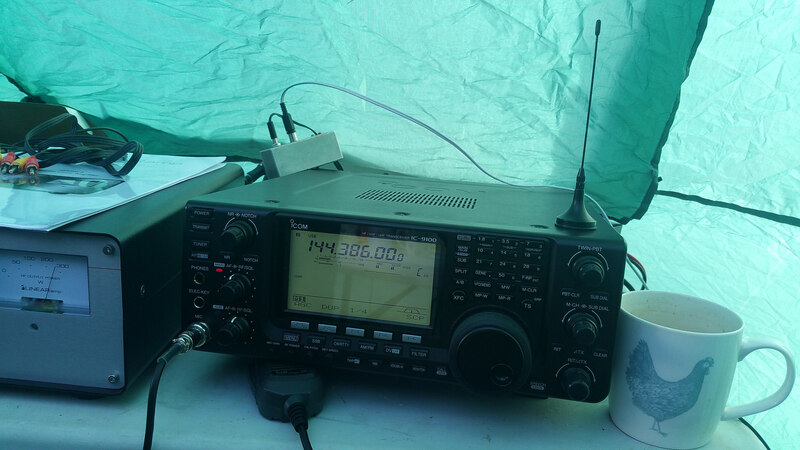 The radio was an Icom 7600 and Expert 1.3 K-FA provided 400w power was provided by a Honda EU20 generator. 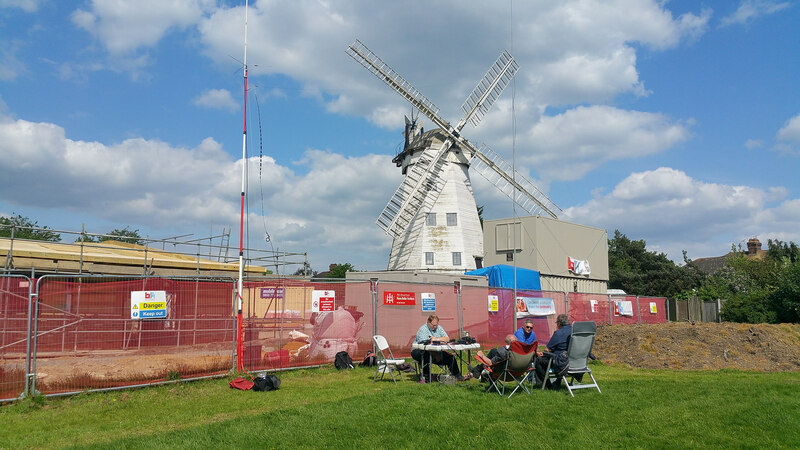 The band seemed very busy, with lots of stations taking part, and I think the good weather helped encourage more portable operating. 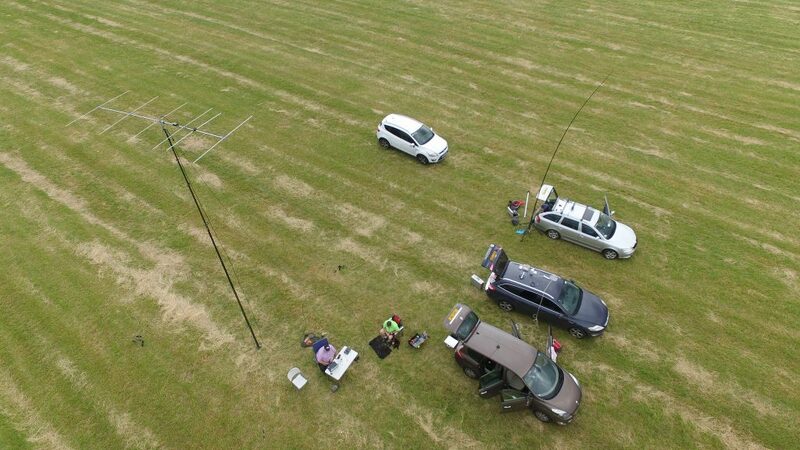 Over the course of the next 3 hrs, we worked 63 Q with our best DX into EI at 585 KM. 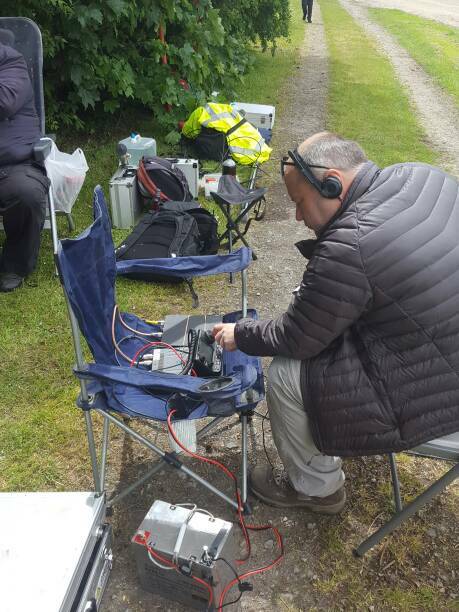 Conditions seemed average, but we did have some very rapid QSO on some of the longer paths, sounded very much like aircraft flutter. 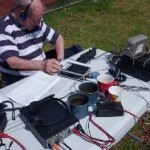 A very enjoyable contest in the sun, thanks to everyone we worked. You can find the claimed scores online. 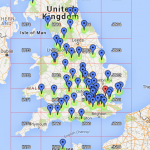 You can view the RSGB VHF contest calendar online. 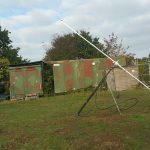 You can read more about the Kelvedon Hatch Secret Nuclear Bunker and the SNBCG here. Members of the Secret Nuclear Bunker Contest Group (SNBCG) assembled at Kelvendon Hatch to try 144 MHz (Earth Moon Earth) EME and MS (Meteor Scatter) over the weekend of the ARRL EME event As a group we have tried with some success MS QSO and this helped lay the foundation for this weekend’s EME event. 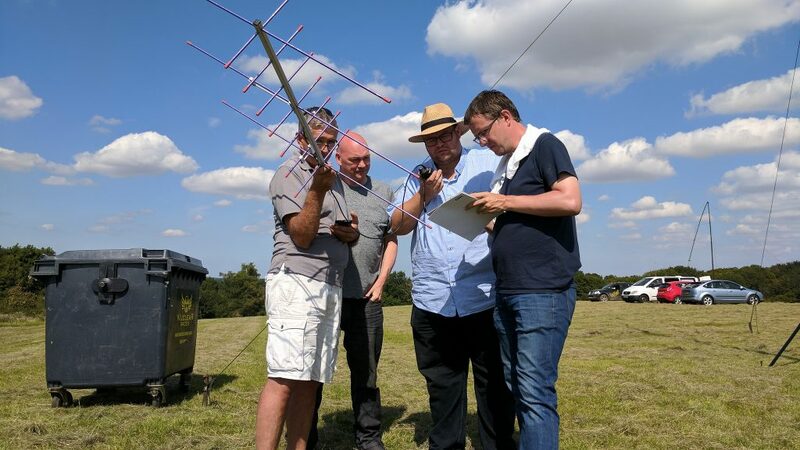 EME is particularly challenging due to the great distances involved and extreme path loss of the signal after its travelled close on 500,000 miles! 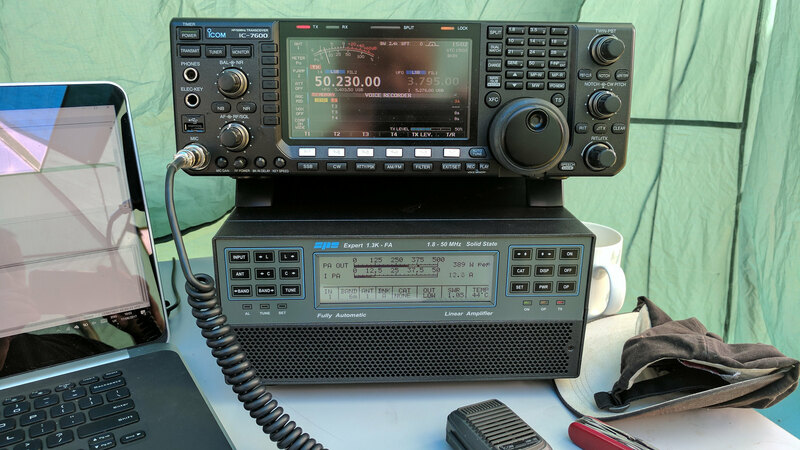 The equipment and format of the QSO is similar to MS, we used the WSJT-X 1.7 (currently in Alpha) and WSJT provided free from Joe Taylor K1JT website. 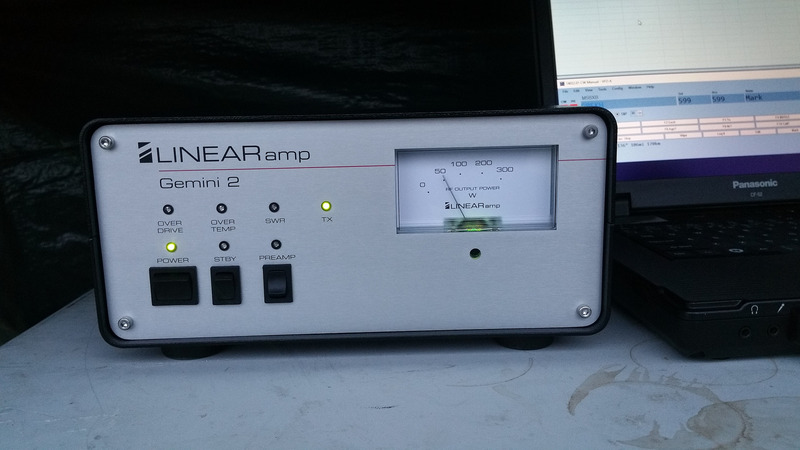 DG8 masthead preamp as designed by Ian GM3SEK with the kit available to order from hupRF. 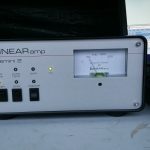 Linear amp UK Gemini 2 VHF amplifier delivering 300w. Low loss LBC600 / LMR600 coax. 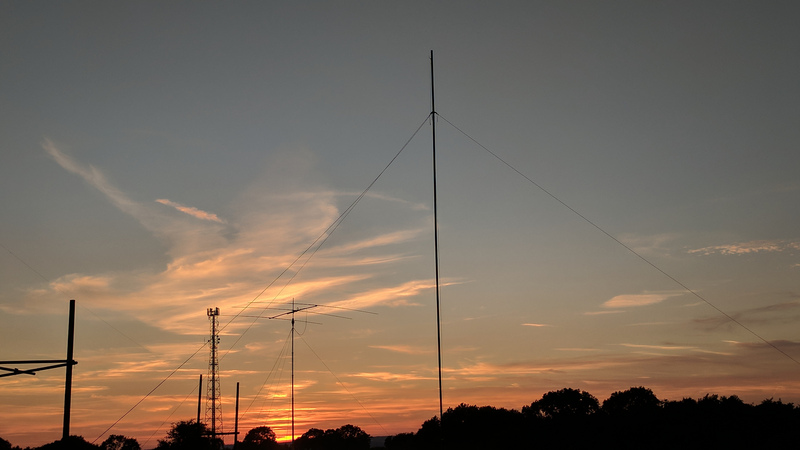 We found we could often decode signals, and even the thrill of decoding signals from the K2VEE in EM79 via the moon was incredible…then it happened. 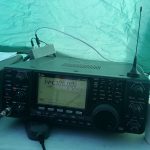 We answered a CQ call by HB9Q and to our surprise they replied. 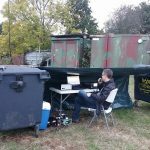 This was our first and it turned out only EME QSO that weekend. 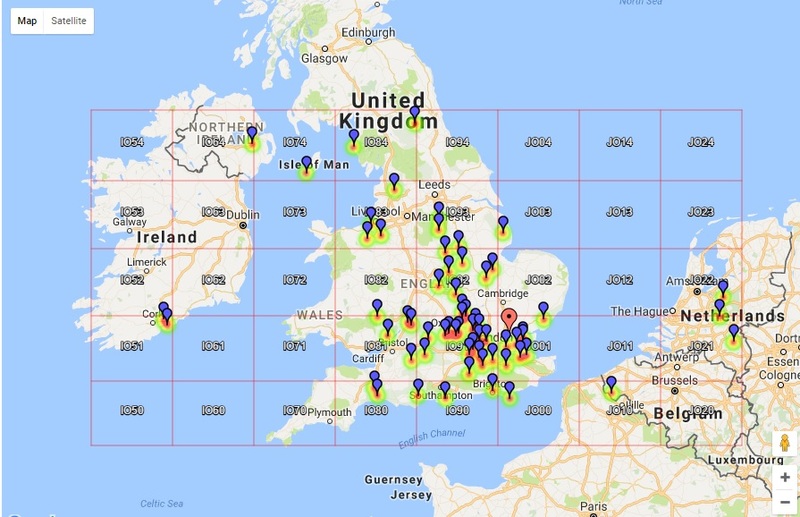 We continued to have quite a few MS QSO working Italy, Slovenia, Denmark and Norway and also a number of SSB contacts with 30 or so UK stations over the course of the weekend. 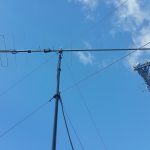 It is always nice to try a new mode and to succeed, you must never underestimate how difficult it is to achieve a QSO over that incredible distance. 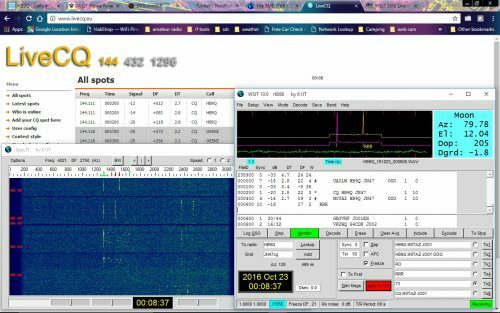 We achieved our goal of making an EME QSO, and regular decoding of signals via the moon. 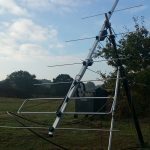 If this has inspired you to have a go I would encourage you to check out K4MSG guide to small station EME. 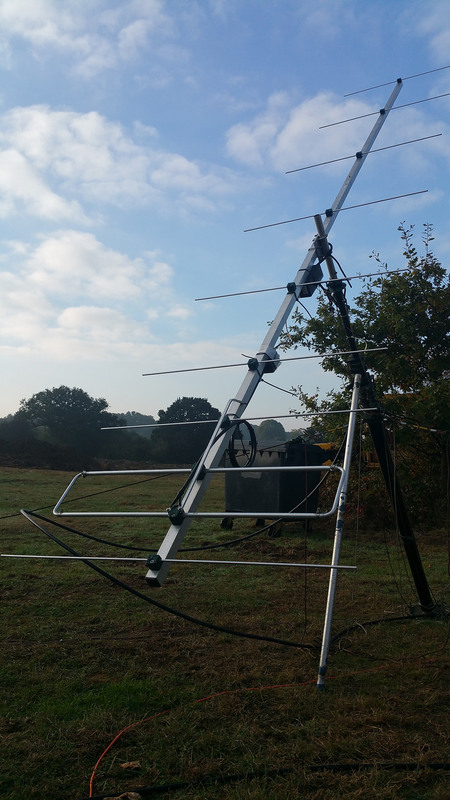 Also have a look at W5UN monster EME array that has bagged him over 11,000 EME QSO ! 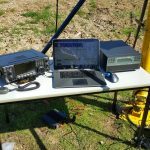 QST also published an interesting article “A Basic Approach to Moonbounce” that you may find interesting. 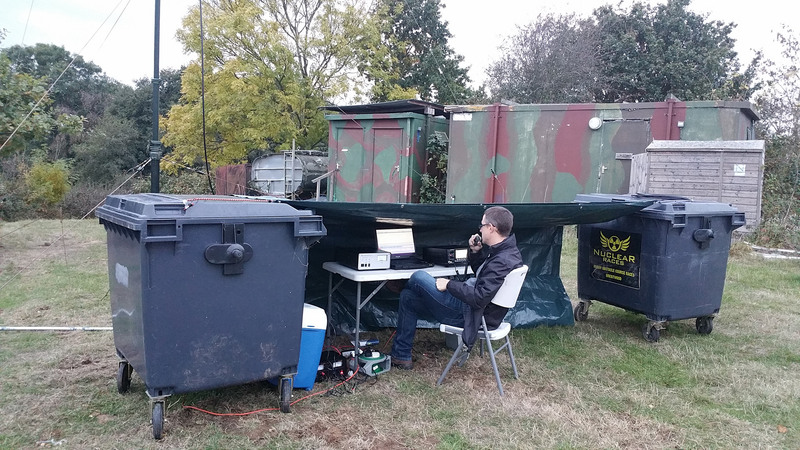 George M1GEO and myself took part in the RSGB 70 MHz trophy contest this weekend at the Kelvedon hatch Secret Nuclear Bunker contest site. 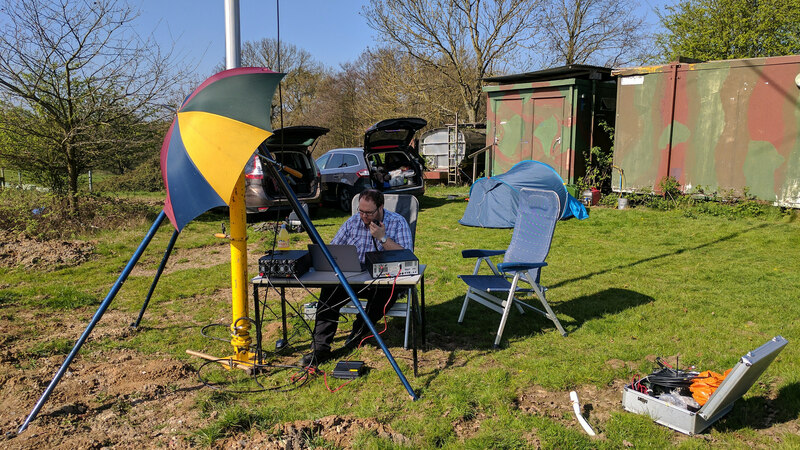 The weather was ideal for alfresco operating, using the Icom 7100 and homebrew 6e beam at 10m on the Racal PU12 mast. 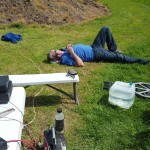 Using 50w and a 85Ah leisure battery we operated from 11am till 4 PM. 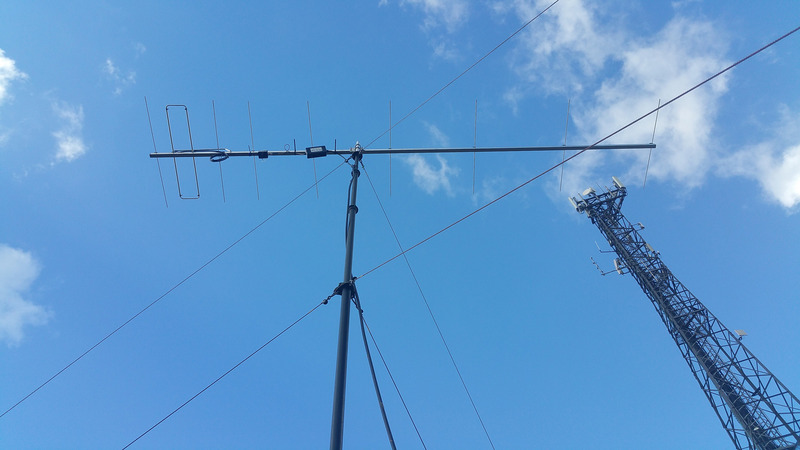 Here you can see the PU12 and home-brew 6e 70 MHz beam. 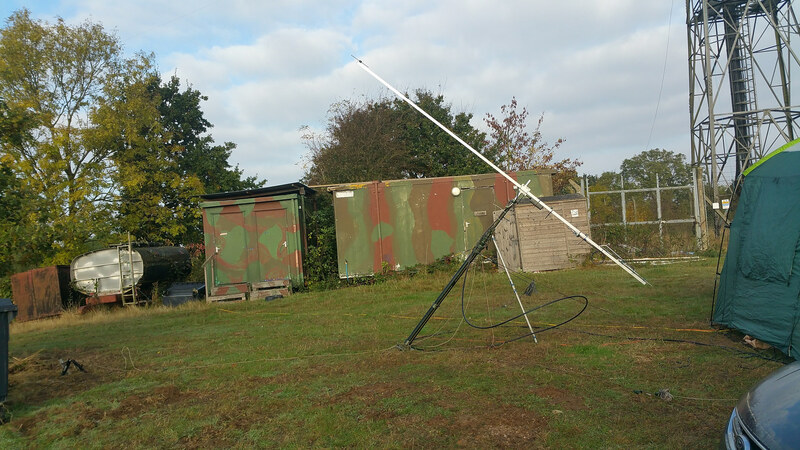 Operating from the base of the mast provided quick access to turn the beam. 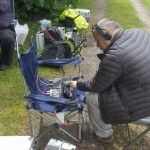 We managed to work 59 QSO with best DX into Scotland at 518 KM. The QSO map is shown here. 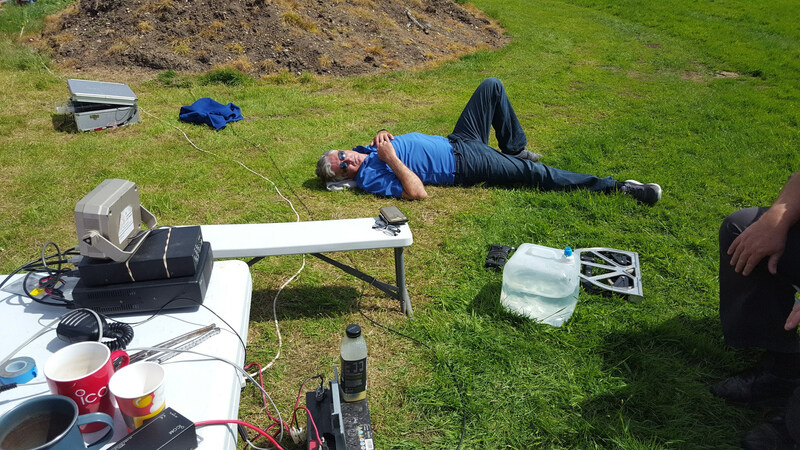 Meanwhile Rob M0VFC was operating QRP HF on 3.5, 7 and 14 MHz using a range of dipoles. 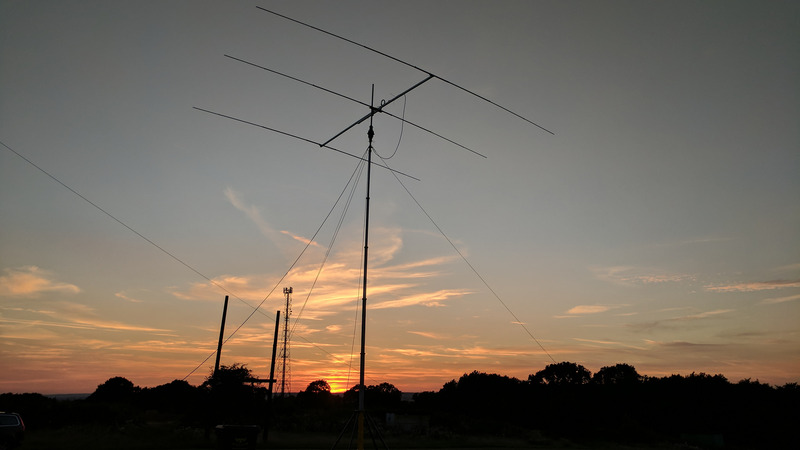 Unfortunately the HF bands have been a challenge at the best of times during the day, and QRP provided to be interesting. 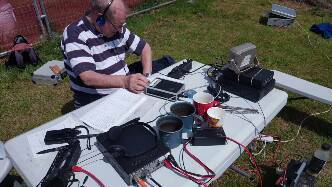 After a few hrs operating Rob had completed 30 QSO, and under the conditions that counts as a sterling effort ! 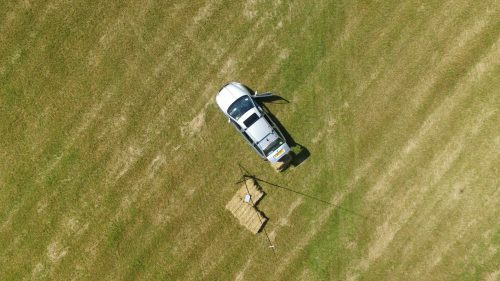 Here you can see Rob operating from the boot of his car Altogether another great weekend of alfresco operating in the sunshine.